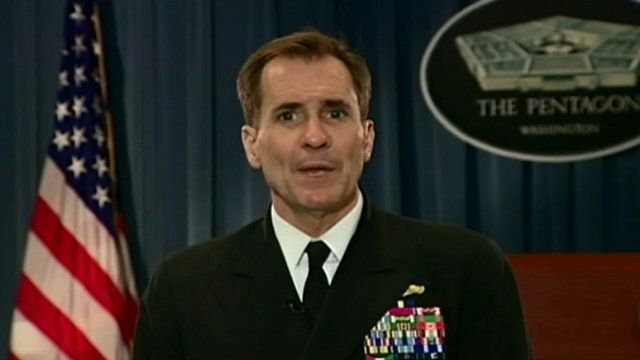 Pentagon: Death 'brings home threat' Jump to media player Pentagon spokesman Rear Adm John Kirby tells the BBC's Katty Kay the death of Douglas McAuthur McCain "brings home one of the real threats here about [IS] and why we think about them in an imminent way"
IS fighters seize Syria airbase Jump to media player Fighters from Islamic State have seized a strategic Syrian government airbase after days of fighting which killed hundreds, activist groups say. An American man, believed to be fighting alongside Islamist militants in Syria, has been killed, the White House has confirmed. And Islamic State (IS) is demanding more than $6m (£3.6m) for the ransom of a female foreign aid worker, US media report. Pentagon spokesman Rear Adm John Kirby tells the BBC's Katty Kay the death of Douglas McCain "brings home one of the real threats here about [IS] and why we think about them in an imminent way".